There was once a sadhaka who approached a Guru for guidance. 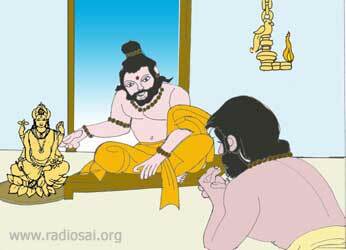 The Guru gave him an idol of Vishnu and all the necessary instructions for daily worship and sent him home. 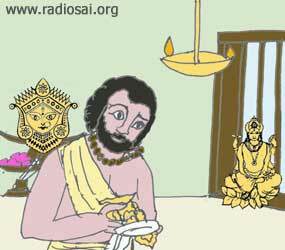 However, after many months of devoted and meticulous puja, the sadhaka did not feel he was getting any results in terms of spiritual elevation or advancement. 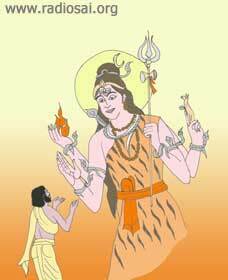 He became frustrated and reported his dissatisfaction to the Guru, who this time gave him a different idol, this time of Shiva, and asked him to give it another try. The disciple returned after another six months demanding yet another idol, because apparently even Shiva had failed him in his quest for spiritual progress. Next, the Guru supplied him with an idol of Durga, which he duly installed in his domestic shrine and did puja to as he was shown. The two previous idols were placed on the windowsill, where they were neglected and gathered dust. One day, while his Durga puja was in progress, the disciple noticed that the perfumed smoke from the incense stick was being wafted by a breeze towards the idol of Shiva on the windowsill. He became irritated that the ungrateful stonehearted God who was deaf to his most sincere entreaties for enlightenment should now be receiving the offering intended for his latest idol! So he took a piece of cloth and tied it around the face of the idol, closing up the nostrils, so that Shiva could not inhale and enjoy the fragrance meant for Durga. To his utter astonishment, at that moment a bright light came into the room and Shiva appeared before the sadhaka in all His splendor and glory. He was dumbfounded. 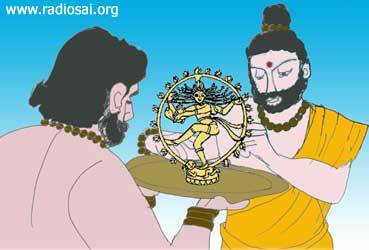 He did not comprehend how his rude treatment of the idol had induced Shiva to appear and give him darshan. It did not make sense to him, so he hurried off to the Guru in hopes of receiving an explanation. The Guru laughed and told the confused disciple what had happened. Without realizing it, the Sadhaka for the first time actually believed that the Shiva idol was Shiva Himself, alive, conscious and chaitanya-full, since he would never have gone to the trouble of tying a bandage around the nose of an idol which he dismissed as a mere piece of carved stone. The very moment he related with all his mind and heart to the idol as being full of Chith (awareness), he instantly obtained blessings from the Lord in his quest for realization.